Although kingfishers are found in many hues and colours, I will present the pictures of the variety found here in North India. Kingfisher is a colourful bird with plume having different colors on different sides of its body. For example, the feathers on the back are bluish and in front the chest part is white and rest is red colour. It is found perched on tree branches, overhead wires and poles near the water bodies. Mostly it feeds on the water creatures mostly fishes as its name suggests. But it also feed on the small insects, and rats. For catching fish, it hovers on water till the catch is within striking range. It then dives very fast and comes out with catch in its long red beak. It biological name is alcedo atthis. The photos were taken with Canon Powershot SX 60 hs model. Mallet Ferry Wharf! I visited the place. It is a ferry terminus and fish trawlers unloading port in Mumbai. You are welcomed by a stench of fishes as you approach the area. Hundreds of fish traders stand up and fish is conveyed to top from boats by ropes and mesh nets. There are mounds of sea fish of every kind. All places are full of fish. There are porters towing it away on the carts. Water drips from the baskets carrying the fish. Trucks are filled by the fish. Every boat has a flag and they are bobbing up and down in the waters. “Bombay duck” which is a fish dries on the ropes in the boats. This fish does not have bones and very delicate to handle when cooking if you are not breaking it into pieces. The hanging fish looks like buntings. There were fisherwomen, very fat and strong. The boats which have emptied their catch were parked to one side. The fishermen on them were preparing the food: lentils, rice and fresh fish. Crows pecked at the fish filled in the basket waiting to be put into the trucks. These seemed to have become bored by eating and eating in plenty. Seaguls caught the flaoting dead fish thrown out of the boats. On the right side is the ferry wharf from where ferries ply to Mora Bunder in Uran and Alibaug, and to Elephanta caves. Ferry journey is very convenient as it takes very less time in comparison to the road journey which entails crossing whole of Mumbai and then to mainland of Konkan. These people usually work as Stevedores in the Mumbai port. During British time, they constituted the major workforce employed for manual jobs. People wait there on the benches. There are shops selling refreshments in the waiting area. Buses from Mumbai ferry the people here. Rice is the staple food of the populations in many countries especially the south east Asian, china and Japan. It is rich is carbohydrates and easy to digest. It goes particularly well with curries of fish and other vegetables. In Bengal, people eat the rice daily. It is considered very pious and is used in many religious ceremonies. A concoction made from rice and milk called Kheer is very popular sweet dish in the subcontinent. Since the composition and climate of different places is not the same, the strains adapt to the given conditions and become localized. They have their unique taste. Below are some local varieties of rice used in Bengal. Local people specifically grow Tulaipanji which is soft-kernelled aromatic rice with good digestibility and use it in marriage ceremonies or annaprasan a ceremony in which infant is offered food for the first time. Like-wise local varities Chini sakkar (taste- like sugar) and Kalonunia (black- textured small rice) are also used for religious ceremonies in Raiganj area of Uttar and Dakshin Dinajpur districts. In Uttar and Dakshin Dinajpur districts, use of broken rice (boiled and fermented) with Coccinia grandis called Jungli kundri, Clerodendrum viscosum called Ghato), Plumbago zeylanica called Chitawar and Vernonia cinerea called Chhepra has been reported for preparing local rice beer called Jhara or wine called Haria. Another variety, Binni dhan, mainly grown in Dakshin Dinajpur, has been mostly used during Kali puja for worshipping Goddess Kali. Generally, aromatic rice, Magursail, is preferred for preparation of Kheer, a kind of pudding made from rice and milk in Dakshin Dinajpur and adjoining regions. A distinct variety, Kala mogha: black- scented rice named after a region, is also used for Kheer preparation by local people in Uttar Dinajpur districts, particularly in Majlispur and Maldwar villages. In Uttar Dinajpur district, local people boil atop (soaked rice) of Kalonunia in milk and sugar or molasses to prepare a delicious dish known as Payas. Parboiling of different rice landraces is common practice in West Bengal. Brine shrimp is an unique animal. It is called Artemia, a class of aquatic crustaceans. First unique trait of brine shrimp is that since the Triassic period, it has changed little externally. This fish possesses the ability to lay eggs which are called cysts which can lie dormant for long periods of time. They are hatched when the conditions in the environment become suitable. These animals are able to avoid cohabitation with most predators like fish by their ability to survive and thrive in highly saline waters. They are found in the enclosed bodies of saline water like Great Salt Lake where the conditions for other forms of life are quite hostile. The ability of dormant eggs has led to its use in aquaculture. When required the dormant eggs are activated by creating required conditions and brine shrimps are produced as a feed for fish. In addition, the resilience of Artemia makes them ideal animals for running biological toxicity assays and is now one of the standard organisms for testing the toxicity of chemicals. 1. The Great Salt Lake brine shrimp population can produce four or more generations per year. 2. Brine shrimp are crustaceans. Their closest relatives include fairy shrimp, triops and water fleas. More distant relatives include crabs, lobsters and shrimp. 3. Brine shrimp are used in the laboratory for testing the toxicity of chemicals. 4. Brine shrimp cysts have been found in Great Salt Lake geologic core samples up to 600,000 years old, so we know they’ve been in the area for a long time. 5. Brine shrimp cysts are packaged and sold as Sea-Monkeys. 6. Brine shrimp cysts can remain viable for up to 25 years. 7. Brine shrimp come in many colors. From white to pink to green, the different colors are probably an effect of diet and environmental conditions. Nature is so fascinated and diverse that we know but a fraction of it. Many life times are not enough needed to understand. In fact, it can be comprehended. Only our collective wisdom from many generations can help us to understand more and more about nature. Brine fish is an example of strange things nature produces. It is early morning. I am looking down from my room in the 13th floor in the hospital. The sea has receded far away and there are fishermen scourging for sea food like crabs, small fish and mussels in the poodles left by receding sea. These men looks like tiny specks from the height. Other people are loitering over the sea surface left dry by the receding sea. The sky is pregnant with looming clouds which are expecting to rain. Sometimes the Sun looks through the clouds and colors the water gold. Now, the day progresses and with it the tides. Soon the naked surface is covered by the rising water.In the beginning the waves die down before reaching the shore. By noon, the waves become very high. They come with a hissing sound towards shore, slaps themselves on the shore and fall away into the sea totally destroyed. I am relieved from the hospital and come down. Before leaving for home, I went to see the sea. There was Bandra Worli sea link in front. The hissing tides came and spent themselves on reaching the shore. Immediately the crows flew into the sand to catch small creatures left by the receding sea. This is supposed to be the onset of monsoon season. So many people collected on the beach to watch the sea which have come to life. Showers relieve the torrid heat and usher the city into romantic, chaotic and deluging times. Some enjoy it, others who have no choice are left to face the fury of nature in coming months. 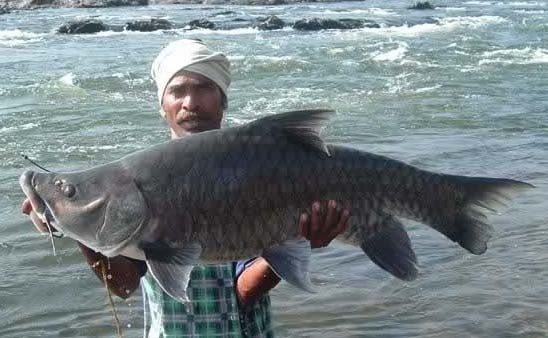 Mahseer is a carp found in the shimmering freshwater riversof Himalaya especially Jhelum. Kashmiris prized this fish. Since Pakistan constructed Mangla Dam on the river in 1967, it became almost extinct on Indian side of the border. Scientific name of Mahseer is Tor Tor. It is a huge fish with size going up to 9 feet and weight more than 50 kilograms and has great strength and is very difficult to get hold of. That is why it got the moniker “tiger in the water”. Incidentally, Kashmiri brahmins are heavy non-vegetarians. Meat is the main ingredient of their diet. Mallet Ferry Wharf! I visited the place. It is a ferry terminus and fish trawlers unloading port in Bombay. Whole area smells of fishes even from a distance. Hundreds of fish traders stand on the platform and fish baskets are conveyed to top from boats by ropes and mesh nets. There are mounds of fish of every kind. Every single inch is covered with sea fish. There are porters towing it away on the carts. Water drips from the baskets made of the bamboo carrying the fish. Trucks and tempos are loaded with the fish for taking it to the different parts of the city. Every boat has a flag and while standing in the parking area these boats bob up and down in the waters. A very popular variety of fish called “Bombay Duck” also dries on the ropes in the boats. This fish is cooked both as fresh or dried and does not have bones. The rows of hanging fish on the ropes look like buntings. There were fisher women, very fat and strong. The boats which have emptied their catch were parked to one side. The fishermen on them were preparing the food: lentils, rice and of course fresh fish. Crows pecked at the fish filled in the baskets waiting to be put into the trucks. These seemed to have become bored by eating and eating in plenty. Seagulls caught the floating dead fish thrown out of the boats. On the right side is the ferry wharf station from where ferries ply to Mora Bunder in Uran and Alibaug, and to Elephanta caves. People wait there on the benches. Most of them are inhabitants of fishing villages. There are shops selling refreshments in the waiting area. They come here on buses from Mumbai and take ferry for crossing the sea and to avoid the torturous road journey. The journey is thus reduced from many hours by the land route to an hour or so. In the earlier times, when British were here most of the work force belonged to people from Konkan Ghats and used the sea route for coming to Bombay. Still many people working at the docks belong to this area.